We’re all familiar with the grade school photographs our parents have tucked away, and which sometimes come out for reunions. Our latest history mystery involves seven children, photographed on the steps of Manchester Union School, probably during the 1940s. There are five boys, two girls; those in the second row are flanking their principal/teacher, Mrs. Alma Jacobs Mendosa. The students appear to be of about the same age, perhaps having just completed their second grade year? Alma Mendosa was born in 1907 in Fort Bragg, but grew near Albion. Alma graduated from Mendocino High School with the class of 1925, and then attended Humboldt State Teachers College. Alma became a member of the Mendosa family through her marriage to August “Gus” Mendosa, of Mendocino, in the summer of 1927. Their home at 44501 Little Lake Road, in East Mendocino, was built for the new couple by brother-in-law, Frank Mendosa. 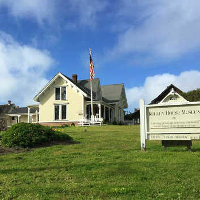 Gus and Alma made many contributions to the community of Mendocino over the years. 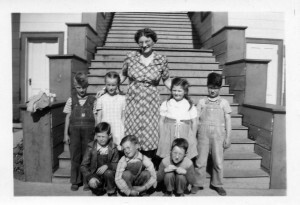 Mrs. Mendosa’s teaching career continued for forty-four years, and included classes at the East Mendocino School, followed by Anderson Valley, and included several years at Manchester, where our photograph was taken. The photograph must have been taken on a sunny day, as everyone seems to be squinting into the sun! 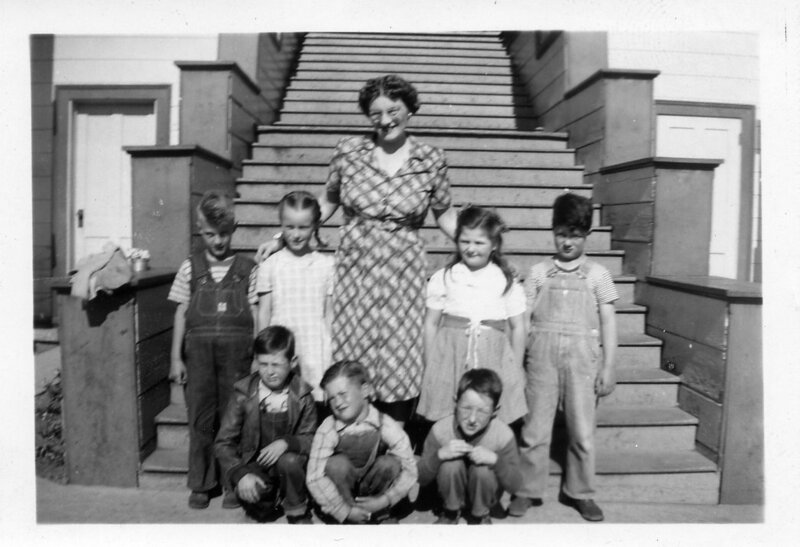 If anyone knows the identity of one of these students, the boys in their overalls (four out of five) and the girls with either braids (a blonde) or hanging loose except where pulled up by barrettes, please contact the Kelley House Museum at (707) 937-5791, or send an email to info@kelleyhousemuseum.org.